I considered using this clip for Sunday's sermon, but I couldn't bring myself to use that word. Check it out and see if you think I made the right decision. Oh, and make sure you're sitting down. It's hilarious. . .
President Bush's schtick at the TV and Radio Correspondent's dinner the other night was classic, and very, very funny! Check it out . . .
Back Home Again in Indiana . . .
Mrs. Frankly and I laid our heads down on our very own pillows at 3:30 AM Sunday morning following a 24-hour marathon trip from St. Louis du Nord, Haiti. We left the mission compound exactly 24 1/2 hours earlier. In between, we rode a bus, six airplanes, a train, a van and a car to get home. The mission trip was amazing. The people in Haiti are in such need, and the folks at Northwest Haiti Christian Mission are making such a big difference. I'm putting together a blog for the folks from our trip to share their pictures and stories. It will be located at www.myhaititrip.com Check back often to see the latest. "Radical trust calls for both belief and action." Gushee is right. If you take a look at the Greek word we generally translate "believe," you discover that it has three facets. Certainly belief, but also trust and response. In order to have a true biblical faith, I must believe - that is my head, I must trust - that is my heart, and I must respond - feet and hands. Therein lies the rub. For centuries, Christians have fussed over the question, "What is the appropriate response?" To be sure, the sinner's prayer is a response. But is it the most biblically correct response? I can't find it anywhere in the NT. So what is the biblical response? It is any number of actions - all of which can be found in connection with the Greek word(s) for salvation: repentance, confession, baptism, sanctification, and perseverance. The blood of Christ bought our freedom; we cannot earn forgiveness. But clearly there are actions we need to take to appropriate that for which Christ died. Leaving for Haiti for a mission trip this weekend. I checked out the 10-day forecast on weather.com and it looks like we'll be in the nineties the whole time we're there. Wow! I am ready for some warm weather! Pray for us while we're working with Northwest Haiti Christian Mission. Gotta Get Me One . . . 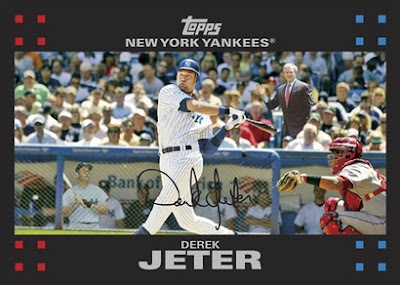 In this undated digitally altered image provided by the Topps baseball card company President Bush smiles and waves from the stands, right, and Mickey Mantle looks on from the dugout at left, as Derek Jeter swings his bat. A spokesperson for the Topps company said that somewhere between the final proofing of the card and its printing - when it was too late to stop it - someone within the company played a joke and inserted Bush and Mantle into the photograph. HOBART, Ind. 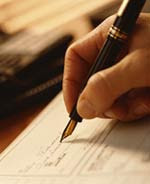 (AP) - Kevin Russell found out it's not easy trying to cash a check from God. The 21-year-old man was arrested Monday after he tried to cash a check for $50,000 at the Chase Bank in Hobart that was signed "King Savior, King of Kings, Lord of Lords, Servant," Hobart police Detective Jeff White said. Russell struggled with police as they tried to detain him, White said, and then threatened police as they transported him to the Hobart Police Department. "I've heard about God giving out eternal life, but this is the first time I've heard of him giving out cash," White said. No court date has been set for Russell. He was being held Wednesday at the Lake County Jail on a $1,000 bond. Maybe God will bail him out . . .